TALENTED young soccer stars were out in force this week. Hat-trick hero Alfie Costello led Isledon Wolves to victory against Copenhagen Youth Project on Wednesday in a special Champions League competition at the Winchester Project in Swiss Cottage. Antony Kearney was also on target as Wolves, who were representing Chelsea, ran out 4-0 victors to be crowned the first-ever Under-11s champions. There were also special trophies for Ardeshir Abazi from Fitzrovia Youth in Action, who won the Fair Play Award, and Copenhagen’s Jordan Jennings-Pitfield, who was voted Goalkeeper of the Tournament. In the girls’ Under-13s final, Hampstead, who took to the field as Arsenal, sealed a narrow 1-0 victory over Chapel, who were representing Spanish side Sevilla. 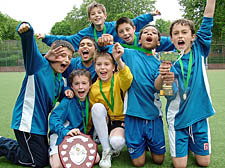 Meanwhile on Friday, triumphant teams from Primrose Hill Primary School and New End in Hampstead were celebrating after winning their respective boys’ and girls’ competitions in the Camden Schools Sports Association Football Championships.